A travel + lifestyle blog sharing adventures abroad, adventures and a life of world exploration! The Te Whara Track is a true hidden gem and one that is not on a lot of people's radar. This 7.5 km one-way track is a tough thigh-burning but rewarding one day hike. 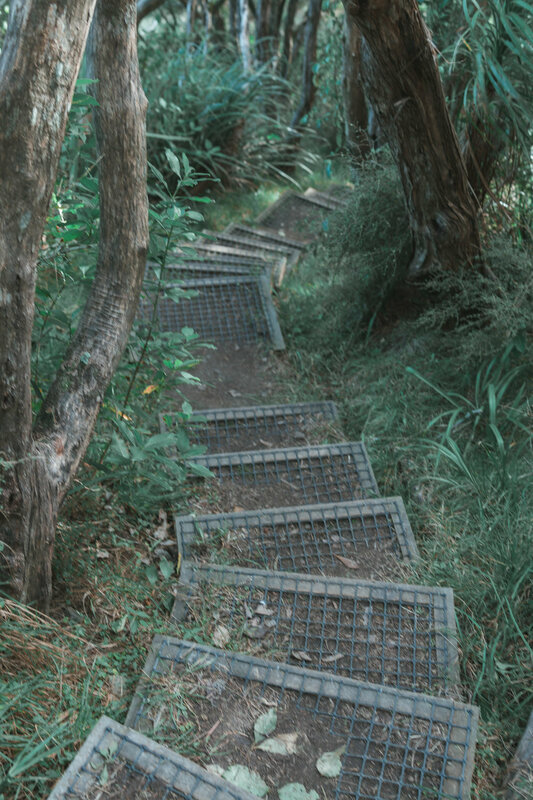 The walk takes you through some of the best coastal forest on the the North Island and you can also stumble across the ruins of a WWII radar station. The views along the track are pretty spectacular and you can see all the way up to Cape Brett to the north and Cape Rodney to the south. We started our day at 6am from Auckland where we drove 3 hours up to the Te Whara Track. We parked at the Ocean Beach car park, took a leisurely stroll across said beach and then immediately began the hike up to the summit of the mountain. This meant that we did the hardest part of the trek first but was rewarded when we reached the top by the stunning panoramic views. For anyone doing this trek, I will warn you that it is a hard trek to the top with a seemingly endless amount of stairs! You will need to be fairly fit and take plenty of water for this hike. From then onwards we hiked up and down the mountain to reach the junction that can take you all the way across to Smugglers Cover or down to Peach Cove. We decided to continue on for a while but soon decided to descend to Peach Cove because the sun was setting soon. The hike took us around 5 hours including our lunch break. From Ocean Beach to Smugglers Cove takes around 5-7 hours. My advice would be to take the road back to where you need to be as this is much easier and quicker than doing the whole route backwards. We took this hike in July which seemed to be a good decision because the weather was clear and sunny but not overall hot - I would not want to do this hike in Summer! At the end we were tired and achy but happy. A great day hike if you're looking to get out into the bush. These birds are called Fantails and they will fly close to you. They won't hurt you but are quite playful and follow you around the track.